Sievert is famous for their plastic welders, open flame torches, electronic hot air welders, soldering irons mini welders and accessories. You can finid all that and more here at BestMaterials.com!For more than 17 years, Best Materials has sold and serviced Sievert Products including propane / butane and electric hot air welders and torches electric hot air welders, as well as propane / butane TurboRoofer field torches, TurboRoofer detail torches, Promatic detail torches, universal propane torches and others Sievert welders are used for hot air welding of roofing membranes, repairing, welding, and shrinking thermoplastics, and even floor seaming, soldering and de-soldering electronic components. Below you'll find accessories & parts to go with the Sievert welding systems. Please call us if you do not find the Sievert welder parts you're looking for! We can special order all Sievert hot air welders, parts and accessories. Contact us and we will save you money. The Sievert TH 1650 can be used to handle many hot air welding needs including your hot air roofing projects. We have in stock many hot air nozzles for overlap welding, speed welding and for welding thermoplastic roof materials. The Sievert TH 1650 is the industries most popular selling walking welder tool. Small and lightweight, the TH1650 heat gun easily meets your most difficult plastic welding, shrinking and overlap welding needs. Interchangeable nozzles fine tune your welding for optimum quality. The TH-1650 has an adaptor tube with heating protection to eliminate the danger of getting burned. The Sievert TH 1650 is capable of welding at a maximum temperature of 700°C. 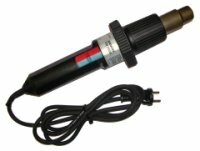 The Sievert TH 1650 heat gun is used by plastic fabricating and geo-membrane installers, as well as electrical and roofing contractors around the world. It comes with a one-year warranty and can last for many years without problems. The Sievert TW 5000 automatic roofing hot-air welder features the latest technology for maximum productivity and welding accuracy. The machine provides optimum distribution of the weight on the pressure roller to prevent the development of annoying creases. With climbing ability up to 30 degrees, adjustable front wheels and independent suspension pressure rollers your are assured trouble free welding of thin membranes and the best performance. The micro-controller provides further control of welding speed and temperature.